Our poorest weekend on the golf tips came last weekend as we finished without a golfer in the top 5 in either competition. Charl Schwarzel played some decent stuff for the first two rounds but faltered on the weekend. Louis Oosthuizen's disappointing 73 on Saturday cost him any real chance of being involved on the final day. He shot a 66 on Sunday but could only manage a share of 12th place. Hopefully we can get back to the form that has saw us tip 28/1, 30/1 and 33/1 places in the last 3 weeks. Rory McIlroy is the outright favourite in The Honda Classic at 11/2 (anyone surprised?) but after his shambolic performance last Sunday, I doubt there will be a huge queue lining up to back him at that price. After he eagled the first hole on Sunday to take him into a share of the lead Rory McIlroy then played some terrible golf, most notably on the greens where he continued to struggle with the putter in hand. People will argue that this was Rory's first tournament at Riviera and he did remarkably well for 55 holes but the Northern Irishman will have to putt a lot better than he did in the Northern Trust Open to have any chance of winning at Palm Beach Gardens again. 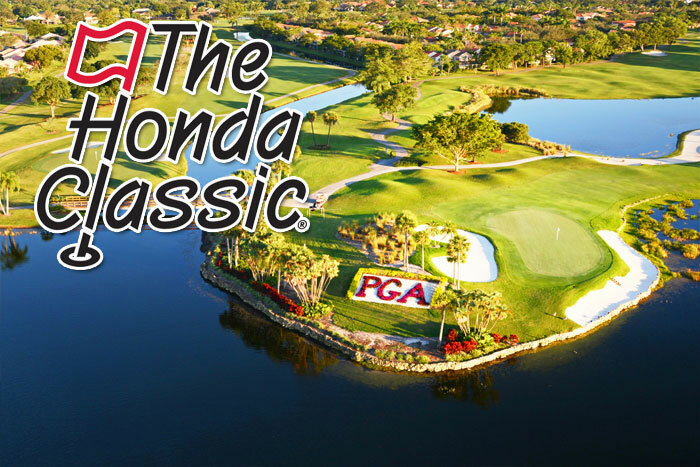 Rory McIlroy lives only a few miles away from The PGA National Champion Course, Palm Beach Gardens, Florida. Its a par 70, 7,158 yards course which is usually a tough test. It is heavily bunkered and water is in play on 13 holes. If you want more detail of the course then check out the Hole-by-Hole link here. Four of the last five winners have finished below -10. The reason you very rarely get a winner much over -10 is because conditions can be very windy. More of the same is expected this week so I don't expect that to change much. Expect the winner to finish somewhere around -7 to -10. Padraig Harrington won last year, he beat rookie Daniel Berger in a play off to win for the first time since 2008. He was a big priced winner last year and he traded on the exchanges at 201 before going on to claim victory. European's have a good record in this competition and thats where half of my money is going. My first selection is Russell Knox at 40/1. He played some brilliant golf at The Honda Classic last year finishing T3rd and although he is coming into this competition on the back of two missed cuts that doesn't put me off as the Scotsman will be right at home back on the east coast when the wind is blowing. T3rd here in 2015 and 2nd here in 2014 - Russell Knox should give us a run for our money. My next selection is Patrick Reed. Another golfer in the field who lives only a short car ride away from this course, he'll know all about the wind. Patrick Reed has gradually been getting better in the competition hopefully meaning that a win isn't too far away. Reed was T7th here last year where he blew his chances on the final day. He shot a 73 on the Sunday otherwise he would've been bang in contention. With Patrick Reed and Russell Knox I think we have a strong hand in Florida. Louis Oosthuizen is the favourite for the ISPS Handa Perth International even though he has never played in Australia before. Punters can take the 9/1 on offer if they want but I'll be looking elsewhere after I watched the South African destroy his scorecard with a poor round last Saturday. That's not to say that he can't win... This is a weaker field than last week however, Louis Oosthuizen will need to be close to his very best to win in Australia at the first attempt. My first selection is Alejandro Canizares who finished T3rd here in 2012. Canizares often plays superbly in his first two or three rounds but then fails to close out tournaments. With the field this week being less than impressive this week I feel the Spaniard has a great chance. Canizares has already said that the change of date for tournament has suited his schedule and he can't wait to play this event. He looks a bit of value at 35/1 considering he's had two top 10 finishes in his last five appearances. My other selection for the ISPA Handa Perth International is Dane - Lucas Bjerregaard. Although he's yet to fire so far in 2016 I feel its only a matter of time before we see this 24 year old from Denmark back winning his first tournament since 2013. Bjerregaard had five top 10 finishes in his final nine appearances of 2015. That included losing to Justin Rose by 1 shot in the Hong Kong Open when the rest of the field were five shots behind. Bjerregard is certain for more top 10 finishes in 2016 but like Canizares he struggles to win. Hopefully this tournament can be the start of a new trend for the Dane. He finished T4th here last year and I'll be hoping he can emulate that performance when I take the 28/1.